LITTLETON, Colo. -- A Florida teenager who authorities say was obsessed with the Columbine school shooting and may have been planning an attack of her own in Colorado just days ahead of the 20th anniversary was found dead Wednesday in an apparent suicide after a nearly 24-hour manhunt. The manhunt had led to the closing of Denver-area schools as a precaution, with classes and extracurricular activities cancelled for a half-million students. During the urgent search, the FBI said Pais was “infatuated” with the 1999 mass shooting at Columbine High School and made threats against the Denver area ahead of Saturday's anniversary of the attack that killed 13 people. McDonald described her trip as a “pilgrimage” to Columbine and cited her purchase of the shotgun as one reason officials took her as a serious threat. “Those two things combined with her fascination of Columbine - that's pretty clear and convincing evidence that she was a threat to the school,” he said. Authorities said Pais was last seen not far from Columbine - in the Jefferson County foothills outside Denver - in a black T-shirt, camouflage pants and black boots. Police were instructed to detain her for a mental health evaluation. Authorities gave no details on her threats but said she did not single out a specific school. 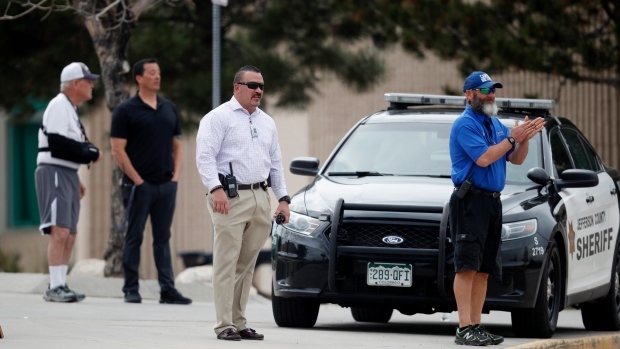 Columbine and more than 20 other schools outside Denver reacted by locking their doors for nearly three hours Tuesday afternoon, and some cancelled evening activities or moved them inside. Two teenage gunmen attacked Columbine on April 20, 1999, killing 12 classmates and a teacher before taking their own lives. They have inspired cult-like admirers and motivated other mass shooters over the decades. Since Columbine, a growing “no notoriety” movement has urged news organizations to avoid naming the perpetrators of mass shootings to deprive them of the notoriety they seek. Adam Charni, a Miami Beach High School senior, said Pais dressed in black and kept mostly to herself. He said he was “baffled” to learn she was the person authorities in Colorado were searching for. Another classmate, 17-year-old Drew Burnstine, described Pais as quiet and smart. “This is definitely a challenge in their generation, and watching my kids learn how to navigate this is really hard. It is really heartbreaking,” said Suzanne Kerns, of suburban Arvada, whose children are 8 and 15.